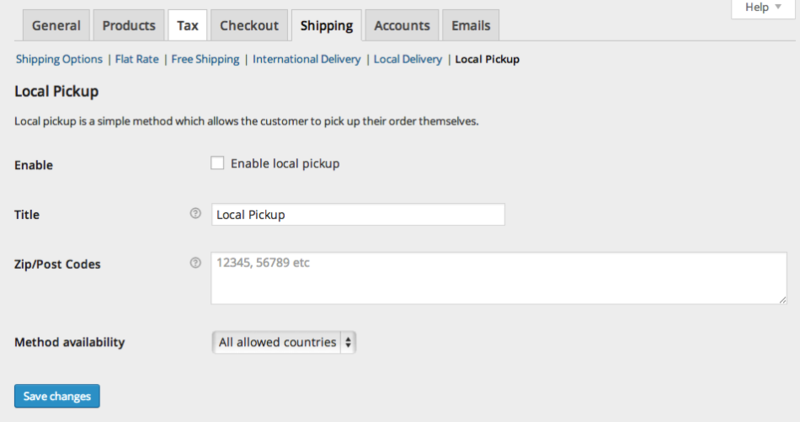 In WooCommerce 2.6 we introduced Shipping Zones that replace shipping options previously in core. If you’re using any of the previous (called ‘legacy’) shipping methods, they will continue to function. But we recommend moving to Shipping Zones as soon as possible because legacy methods will be removed in future releases. Shipping Zones allows options to be used multiple times, so some former methods (such as international flat rate) are no longer required and can be replaced with Flat Rate Shipping. 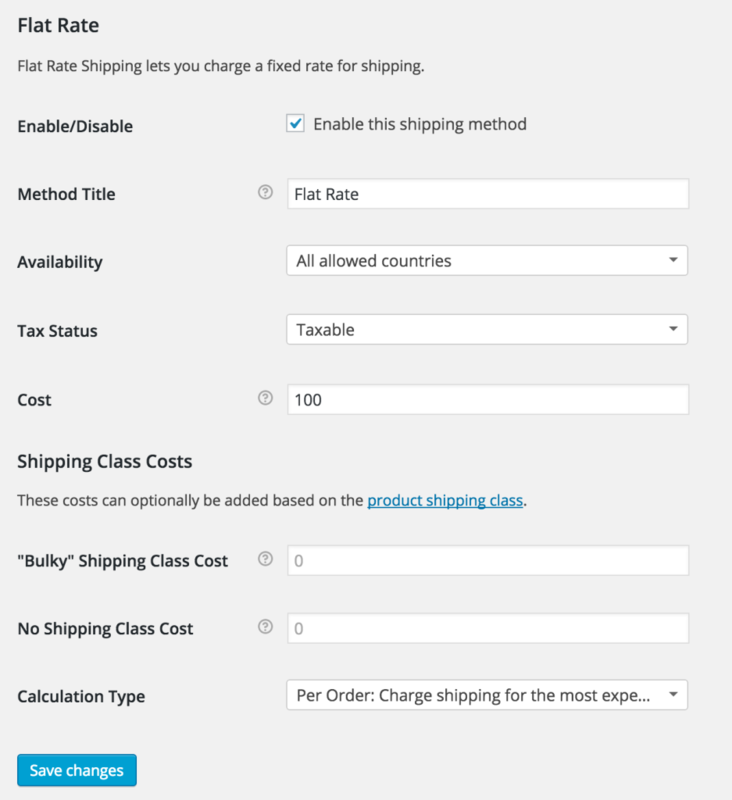 Flat Rate Shipping is a shipping method included free in WooCommerce that allows you define a standard rate per item, per shipping class or per order. Settings are found at: WooCommerce > Settings> Shipping > Flat Rates. 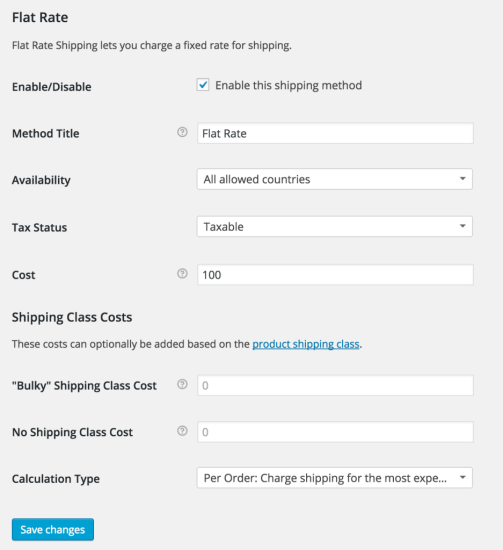 Flat Rate Shipping works with Product Shipping Classes, adding more power and flexibility. Enable/Disable – Tick the box to enable Flat Rates. Method Title – Name the method. This is what the customer sees when selecting a shipping method. Availability – Define ‘All allowed countries’ or ‘specific countries’ to limit where Flat Rates are offered. Tax Status – Define whether or not tax is applied to the shipping amount. Cost – Define a cost applied to the entire cart. You can add additional costs per item to this field. This is covered below. The Cost field allows you to charge a flat rate per item, a percentage based cost, or a minimum fee. 20 + [fee percent="10" min_fee="4"] – A base shipping cost of $20 plus 10% of the order total, which is at least $4. There is one cost field for each shipping class. No Shipping Class Cost – Useful if you use the Per Class option below. Otherwise, use the Cost field. Per Order – Picks the most expensive option based on shipping costs in the cart. Per Class – Charges shipping for each shipping class. 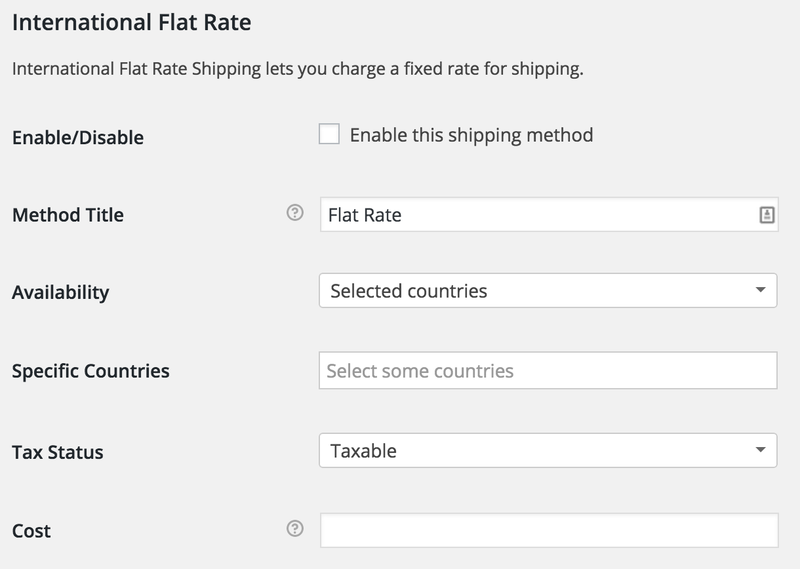 International Flat Rate is based on Flat Rate Shipping, which allows you define a standard rate per order, per item or per shipping class for international delivery. The settings page is found at: WooCommerce > Settings> Shipping > International Flat Rate. 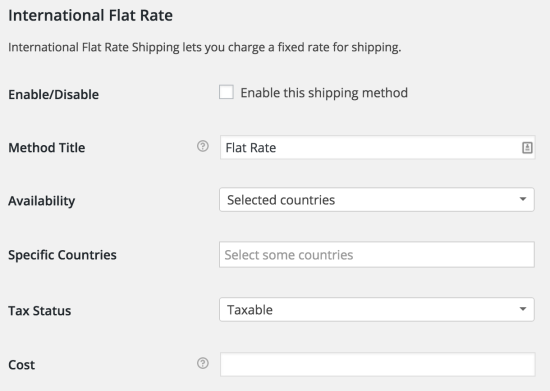 International Flat Rates works with Product Shipping Classes, adding more power and flexibility. Enable/Disable – Tick the box to enable International Flat Rates. Availability – Define ‘All allowed countries’ or ‘specific countries’ to limit where International Flat Rates are offered. What if you want to charge an international flat rate per item? Or a percentage-based cost? Or enforce a minimum fee? This is why we allow math in the Cost field. There will be a cost field for each shipping class you have. If you enable free shipping, customers will have access to free shipping on their orders. This is a great shipping method to use to encourage customers to spend more. For example, give them free shipping on orders over $100. Be sure you give it a Method Title and set a Method Availability. 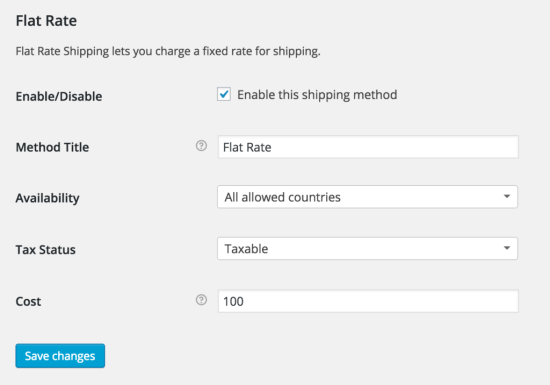 In Method Availability you can choose All allowed countries, letting any customer from any country be eligible for free shipping, or Specific Countries. If you choose Specific Countries a new field titled Specific Countries will appear you can use to limit free shipping to. A minimum order amount (defined below) – Set the amount in the Minimum Order Amount field. First create a coupon and then tick the Free Shipping box. More info at: (Coupon Management). In ‘free shipping’ settings, tick the option to require a free shipping coupon. Thats it! Customers can now use the coupon to get free shipping during checkout. If you have coupons for free shipping and min-amount, coupons take priority. If the user has a coupon, the min-amount is ignored. If, however, the user doesn’t have a coupon, min-amount will be checked. Local Delivery has been removed from Legacy Shipping. See Shipping Zones. Local delivery is a shipping method for delivering orders locally. The fee can be specified based on a percentage of the cart total or a flat fee, or it can be free. Taxes for Local Delivery are based on the store location settings. If your tax rules are based on postcodes/zipcodes, then you need to use a function to ensure the store postcode/zipcode is included. Local Pickup has been removed from Legacy Shipping. See Local Pickup for WooCommerce. Local Pickup is a method that allows the customer to pick up the order themselves. 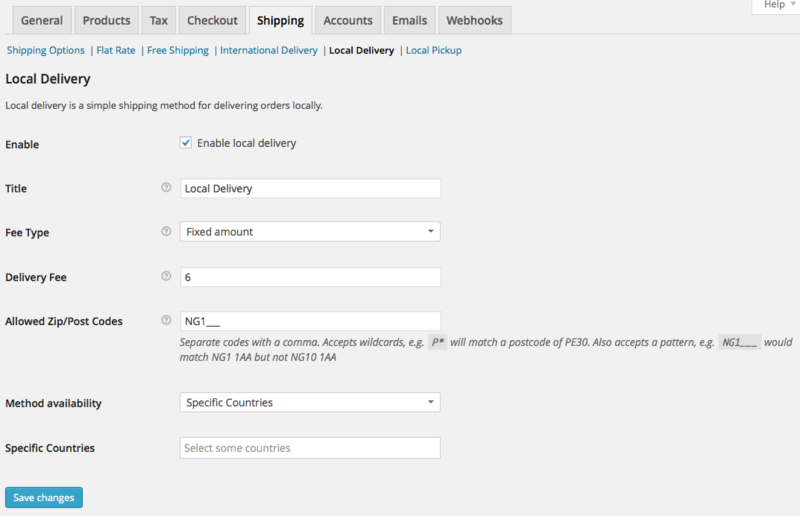 You can enable and configure Local Pickup from WP Dashboard > WooCommerce > Settings > Shipping > Local Pickup. Note: The Local Pickup shipping method calculates taxes based on your base store location and not the customer’s address.